The 1970 Thunderbird had been new from the ground up. In competition against the Buick Riviera and other large personal luxury coupes, the T-bird finally obtained a full perimeter frame to better isolate the passengers from the road, eschewing the unit body construction used since 1958 in the process. By 1972, the unusual beaked front end styling of the prior two years had finally been toned down, and the car began an upward trajectory in sales numbers, moving from 36,055 in 1971 to 57,814 in 1972 and a near record 87,269 in 1973, just short of the 1960 T-bird top sales of 90,843. Obviously, the nose job was a success. 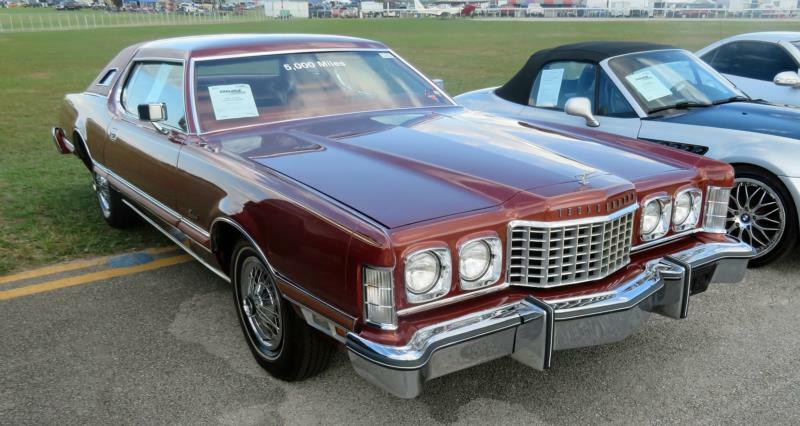 In fact, these cars shared major components with the Lincoln Continental Mark IV and had similar luxury, presence, ride, power and panache for almost $3,350 less. The 429 V-8 of 212 hp was standard in 1972 T-birds, with the 460 V-8 of 224 hp optional. Arguably, the 1972 cars were the best looking of this generation given the fact that the 1973 and later cars were forced to adopt new crash-bumpers, which added bulk to the look both front and rear. At least the already large Thunderbird carried the new look better than did smaller cars, which suddenly looked like bumper cars at the midway. The 1973 cars were facelifted with a new grille, new headlight surrounds, small opera windows, hood ornament and other detail changes. In this era, luxury still meant size and presence. The Thunderbird theme had not really changed since the revision from the two-seater personal cars of 1957 into four-seater personal-luxury cars of 1958, but the expectations of the buying public had. The oil crisis that began in October 1973 almost immediately hampered sales of most big American cars, but the Thunderbird soldiered on, dropping to 58,443 sold in 1974, which was also a bad recession year. The 460 engine became standard for 1974. The 1975 cars came out largely unchanged, except for new emission equipment including a catalytic convertor. 1975 became an even worse recession year than 1974, so sales were down to 42,685. 1976 was again nearly unchanged, except for special editions including a Lipstick edition, Bordeaux Luxury Group and Crème/Gold Luxury Group . Sales increased to 52,935. Given the 1972 sales, the biggest ever T-birds were what the public wanted if they could afford it (prior to gasoline more than doubling in price, that is). Back in the day, these cars were clearly marketed to the upper middle class, as aspirational cars despite the Ford badge that didn’t seem to detract from desirability. Advertising for 1976 asked “Could this be the best luxury car buy in the world?” Looking at what exactly you got for your buck, it probably was. Today, few of these cars are around because so many got sent to the scrapyard after the second OPEC fuel crisis of 1979-1980, which happened in the wake of the Iranian revolution. The nicer ones that escaped the crusher are therefore cherished by owners. Even so, they remain fairly attainable.